Weddings on the beach present unique rewards and challenges. Certainly, the beach is one of the most romantic wedding venues. The gorgeous scenery is the great backdrop for a destination wedding or if you are fortunate enough to live near a beach. And here are some beach wedding ideas to make your romantic wedding. First of all you can set the stage for your wedding by having a beautiful sunset hand painted on your beach wedding invitation. 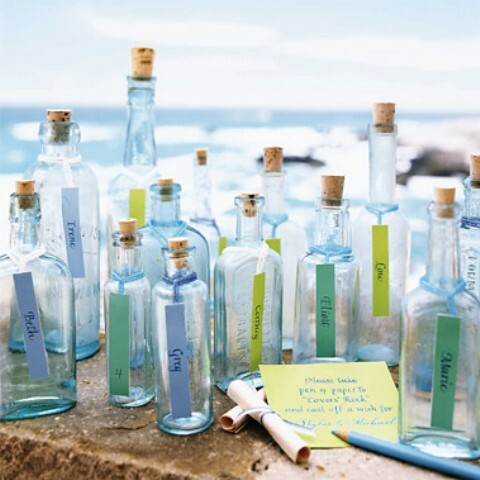 Or you can send "message in a bottle" invitations with a number of shells and a touch of sand. Select a wedding dress with halter or spaghetti straps for elegant yet casual beach wedding attire. For bridesmaids, select shorter dresses in chiffon and in lighter colors. Outfit the men in seersucker or all white. 5 Responses to "Romantic Beach Wedding Ideas Decor"
Hi! I am visiting your site almost everyday co’z I’ve seen so many cute and lovely inspirations from your site since the first time I came here. Every thing you have shared in your post are really eye catching and fabulous. Really useful info. Thnx! Np! By the way, I am your newest follower! Thanks for sharing those wonderful inspirations! Nice meeting you Johan! :) Keep the nice work up!